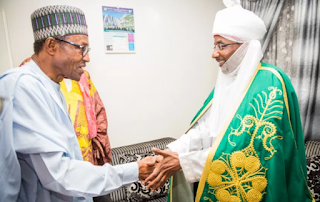 Emir of Kano, Sanusi Lamido Sanusi has said that Nigeria is suffering a leadership crisis because its leaders are selfish. Sanusi also spoke against Buhari's economic policies saying it would be wrong to overlook economic policies that does more harm than good to Nigerians. “The bane of leadership in Nigeria is that the leaders are selfish; they only think of their families. Those of us who think that public office is a place to enjoy ourselves should think again,” he said according to Vanguard. Sanusi also said that the security challenges being experienced in the country were caused by poverty and lack of education, among other things. The Emir of Kano has persistently faulted the Buhari administration’s economic model, saying it would not work. "Only evil people will refuse to fault policies that have brought untold hardship on Nigerians. "Just take a look at the level of inflation and unemployment in the country and you would understand what I mean. "Millions of Nigerians have lost their jobs in the last two years, mainly because of the jaundiced economic policies of this administration." he said.